We are thrilled to announce we are the first outlet in the Hudson Valley to be selling Cold Brewed High Tea with Hemp CBD! We are thrilled to announce we are the first outlet in the Hudson Valley to be selling Cold Brewed High Tea with Hemp CBD! We've been fans of Miriam Novalle's (dubbed the "tea guru" by the New York Times) T-Salon teas for a long time and are now honored to also be selling this new product she has created. We start with the finest teas, then use the cold brew process which involves steeping tea in filtered cold water for an extended period. This process brews the tea leaves slowly, using time rather than temperature to release the flavors.We then add Hemp CBD 15 ml per bottle. Hemp CBD – derived from the leaves of the hemp plant contains omega-3 fatty acids, terpenes, vitamins and chlorophyll. It is suggested for relaxation and to provide a calm state of body and well-being. CBD has many health benefits without causing a psychological high like THC. The way CBD works is that it activates cannabinoid receptors that are part of the endocannabinoid system that is located throughout our bodies. The endocannabinoid system is involved in a variety of physiological processes including appetite, pain cessation, and memory. 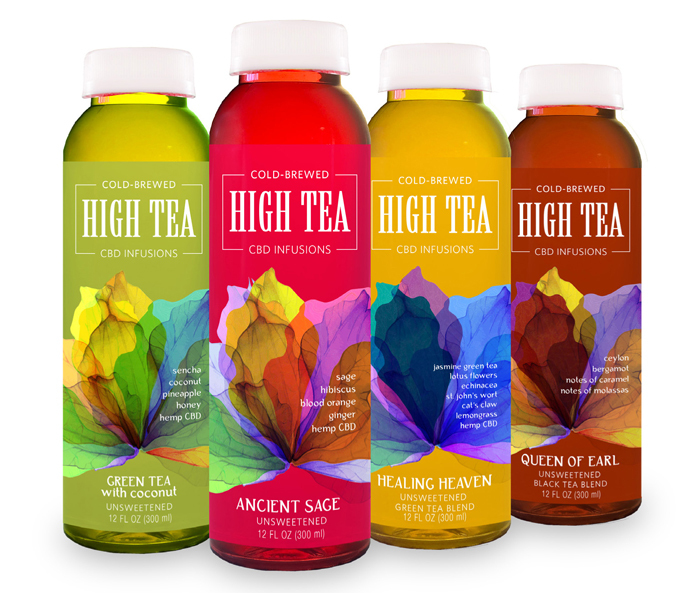 We're offering High Tea in two different product lines: as a cold beverage in 12 ounce bottles and in packaged tea bags, which come 10 to a package. We're looking forward to trying these ourselves and to sharing them with our community. Come on in and try one! They're delicious!